Lake Burley Griffin was silky smooth as the sound of the Canberra Peace Bell rang across it this morning, when Christopher Latham, Artist in Residence at the Australian War Memorial, struck the big bronze bell to announce the coming of the Diggers Requiem. The last movement, written by Ross Edwards, incorporates 62,000 bells, one for each Australian who died. Some of those bells were played by percussionist Veronica Bailey, on her vibraphone, other handbells will be played live at the time, and incorporated into the recording of a pattern of bells will be the huge bell struck this morning. In an astonishing piece of musical teamwork, The Diggers’ Requiem has been composed by seven contemporary Australian composers working with Chris Latham on existing and new pieces. Composers Nigel Westlake, Elena Kats-Chernin, Richard Mills, Graeme Koehne, Ross Edwards, Andrew Schultz and Christopher Latham have all written movements. One movement is by recently discovered WWI composer Septimus Kelly. Christopher Latham & Veronica Bailey, striking the peace bell, photo Graham Tidy. The Requiem represents in 12 movements the battles of Fromelles, Pozières, Bapaume, Bullecourt, Villers-Bretonneux, Hamel, Amiens, Péronne and Mont Saint-Quentin, Bellenglise, Montbrehain, Ypres and Passchendaele in Belgium. It refers to death of the Red Baron and the charge of Beersheba in Palestine, which was the last great charge of cavalry. ‘The traumatic experiences of those young men who served a century ago can be seen in the thousand-yard stare of the Unknown Soldier, painted in 1918 by H. Septimus Power. The Diggers’ Requiem has been created to be a memory space for contemplation; a musical memorial to those who were killed, wounded, or damaged by their service. These works have been commissioned to be the musical counterparts to the Official War Art created by Australia’s great painters of the time, which will be projected in the October 6th concert, to give the public a real sense of the Australian diggers’ experiences in the battles of the Western Front and Palestine. In the lead up to the Requiem we will be telling you more about each movement in this newsletter. The Australian Premiere of the Diggers Requiem will be performed by the Australian War Memorial Orchestra and Choir and will be broadcast on ABCFM. It is not to be missed. Tickets available from Ticketek: full price $65; concession (pensioners) $55; under 24 (average age of fallen soldiers in WW1) $24; under 5s free. Saturday 6 October, 7.30 Llewellyn Hall, Canberra. An extraordinary concert of musical and artistic treasures lost to the Great War, curated and arranged by Christopher Latham for soprano, tenor, chamber choir, string quartet and piano in order to mark the centenary of the final days of WW1. The music of composers from nine countries, lost to war or disease, are combined with the vivid projected images of paintings by Gustav Klimt, Egon Schiele (Austria), Umberto Boccioni (Italy), Franz Marc, August Macke and Wilhelm Morgner (Germany) who also died during WW1. Directed by Christopher Latham, artist-in-residence at the Australian War Memorial. THE LOST JEWELS – masters and masterworks lost to the Great War. Behind the Scenes with the Flowers of War. Anna Vidot, (presenter) Chris Latham, Lish Fejer (producer) and Veromica Bailey setting up to listen to the vibraphone in ABC Radio Canberra. How do you move a vibraphone? With difficulty. 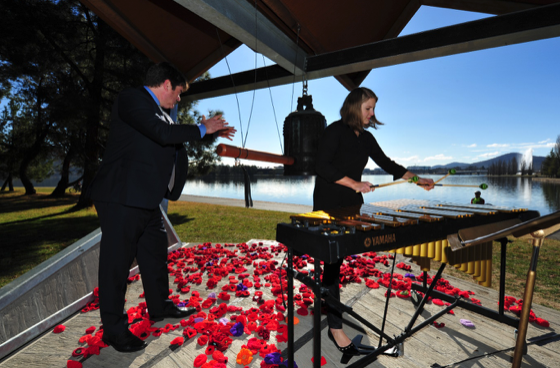 When the Flowers of War publicist Marilyn Chalkley asked Veronica Bailey, percussionist to bring her vibraphone into the ABC, and also to Nara Peace Park next to Lake Burley Griffin, little did she realise how tricky that would be. Of course, a vibraphone doesn’t fit into the back of a normal car, so you have to unscrew all the golden metal bars, and all the bits and pieces underneath. Felt or wool beaters are used to strike the bars, giving a soft, mellow tone quality. Suspended vertically below each bar is a tubular, tuned resonator that sustains the tone when the bar is struck. The golden bars are pretty precious, so Veronica and her husband arrived at Nara Park, each cradling them in a towel like babies. Then they put the whole thing together, and Veronica played like an angel. Here we are in the foyer of the ABC with half a vibraphone. It would have helped if we hadn’t lost a screw somewhere in transit, so Veronica had to hold her breath while playing, and hope that the pedal wouldn’t come undone. You will be able to hear Veronica playing in the interview. Like an angel again.